The countertop is an essential component of the kitchen and bathroom. All the action takes place on countertops requiring countertops to walk the fine line between beauty and functionality. 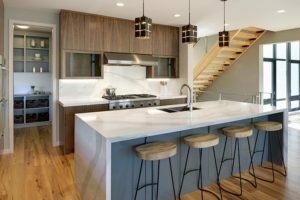 Countertops are the foundation of décor choices in these spaces, setting the tone and feel of the space while reflecting the style of the homeowner. The range of countertop materials is quite large, ranging from concrete and butcher block to natural stone and quartz. While granite is still a leading choice for homeowners and designers, quartz is increasingly popular for its versatility and durability. Created as a more affordable alternative to granite, quartz has the benefit of being non-porous, thus it does not require sealing, and comes in a variety of colors, styles, and patterns. Kimberly Schmunk of Focus Builders points out that, as a material, quartz is hard to beat, “Quartz is in strong demand because it isn’t porous, won’t stain, doesn’t scratch easily, is uniform in color and pattern, won’t discolor over time, is resistant to heat, and has a smooth surface for easy cleaning,” she says. Despite this, she says granite/natural stone is most popular with clients. “They like leathered and honed marble and granite, which provide a nice matte texture,” she says. Experts agree that textured and tactile finishes are becoming more popular as design options. Although a polished finish remains what most homeowners want, honed and leather finishes are both gaining popularity. A honed finish is a matte finish with little to no shine that conceals flaws or scratch marks, while a leather finish provides a soft sheen that retains the stone’s natural look while hiding fingerprints and water spots. 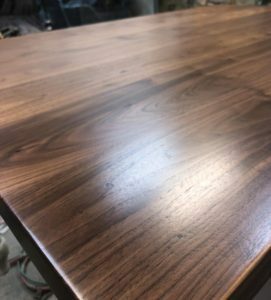 Skillington reports black walnut has now found its way into today’s modern kitchen as a high-impact countertop material due to its durability, natural beauty, and adaptability to transitional as well as modern designs. “We have seen many sinks and cooktops installed into island countertops made from 2-in. black walnut. Like any counter material—wood or stone— you may decide to refinish it every few years to ensure it stays at its most beautiful. Josh LaWarre of Willow Branch Partners agrees saying, “The most important features of countertop materials are looks and performance and they must compliment the homeowner’s sense of style.” Homeowners should also consider their service installer as an important component of the countertop choice. While subtle patterns and color options draw many clients to quartz, LaWarre says there has recently been a move toward darker shades, high contrast, grays, blacks, and whites. 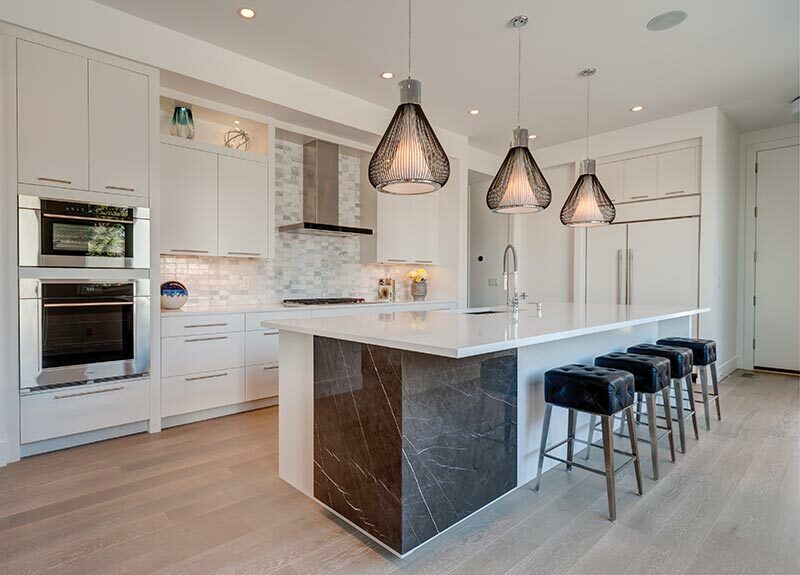 While granite remains popular, Van Eeden says many of her company’s clients favor quartz that resembles marble which continues to find favor with a large number of homeowners. Van Eeden suggests that homeowners should consider the quality of material, turn-around time, and follow up service available from the countertop provider. 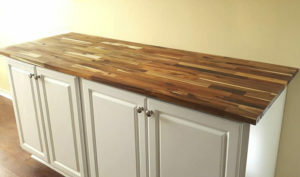 Speaking of Chroma as a superior countertop material is Ken Schusterman of California Closets. “Produced from optical grade engineered resin, Chroma is a highly functional material that brings impact to an area when color is introduced. Its surface features a durable, renewable matte texture that can easily be refinished throughout its lifetime. Backlighting can be achieved with Chromas as well. Choosing a countertop material also involves selection of a sink in most cases, and in many cases that may be an integrated sink. Giving a modern finish to space, creating a continuous style from countertop to sink offers a smooth flow from work surface to clean up. While style is of the utmost importance, ease of use plays an important role. An integrated sink allows homeowners to no longer worry about dirty water or food bits getting stuck in the space between countertop and sink. 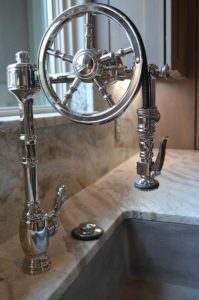 Of course under-mount sinks of all types—stainless steel, vitreous china, or some other material—continue to remain popular. Farmhouse sinks, also available in a variety of materials, are often the leading element in countertop design. 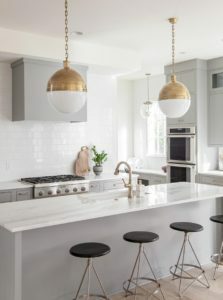 As homeowners continue to seek looks that are out of the ordinary, they find themselves choosing countertops, plumbing fixtures, and sinks that create a cohesive look while still meeting the low-maintenance needs of most homeowners.